Cut fish fillet into 2 pieces, season with salt and pepper and lemon juice. Julienne ginger finely. Slice garlic and chilli into thin slices. Boil water in a steamer, once water is boiling, place fish in a place into the steamer for 8 minutes. Mix tamari and brown sugar in a bowl. Heat pan with coconut fat and fry ginger, garlic and chilli until slightly brown. Pour everything onto the soya sauce mixture. Give it a quick stir and pour over fish. Serve warm with rice. Note:You can garnish with some julienne vegetables on the side or on top if you like. Avoid ginger and chilli for adrenaline problems, it can still be as good with only garlic. This recipe is taken from my “Clean Anti-Inflamatory Diet Cookbook which I am still working on. 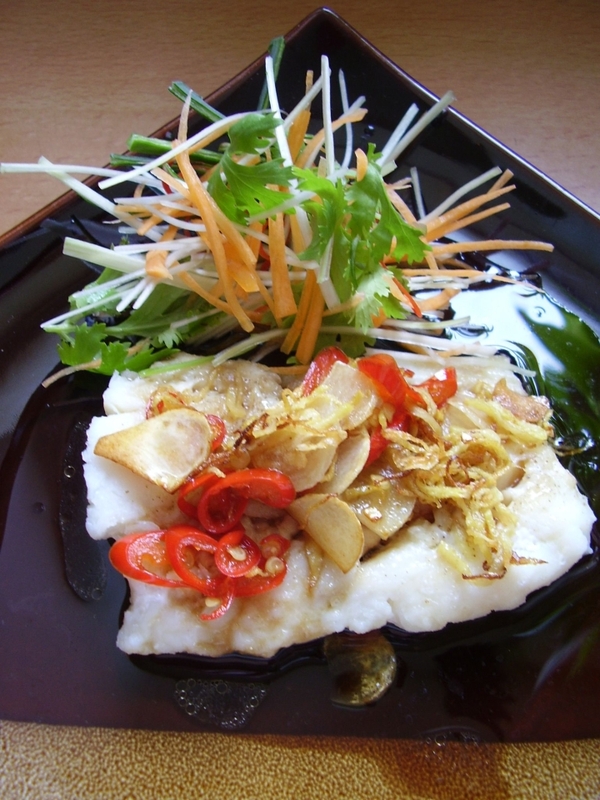 Use any white fish to replace cod if you like. so simple, YET I know it is going to taste real good ! !